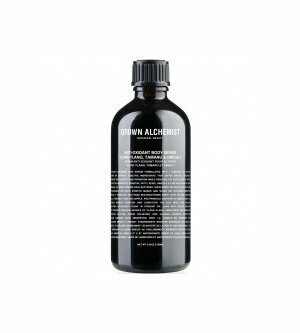 Why we love it: Achieve a silky smooth radiance with this luxurious body oil from Grown Alchemist. Powerful Seabuckthorn Berry tones and evens the skin texture while Tamanu Oil restores and revitalizes skin suppleness. A high concentration of lycopene-rich Rosehip Oil brings radiance and glow to the complexion. Ylang Ylang, Sandalwood and Bergamot Oils create an alluring aroma. Massage into dry or damp skin until absorbed. Prunus Amygdalus Sativa (Sweet Almond) Kernel Oil, Camellia Oleifera (Camellia) Seed Oil, Tocopherol (Plant), Aniba Rosaeodora (Rosewood) Wood Oil, Cananga Odorata (Ylang Ylang) Flower Oil, Citrus Bergamia (Bergamot) Peel Oil Expressed, Rosmarinus Officinalis (Rosemary) Leaf Oil, Cedrus Atlantica (Cedarwood) Wood Oil,Lavandula Angustifolia (Lavender) Oil, Citrus Aurantifolia (Lime) Peel Oil Distilled, Rosa Canina (Rosehip) Fruit Oil, Hippophae Rhamnoides (Sea Buckthorn Berry) Fruit Oil,Calophyllum Inophyllum (Tamanu) Seed Oil, Santalum Spicata (Sandalwood) Wood Oil, Jasminum Grandiflorum (Jasmine) Flower Extract, Myroxylon Pereirae (Peru Balsam)Oil, Vanillin (Plant), Linalool (Plant), Limonene (Plant), Benzyl Salicylate (Plant),Farnesol (Plant), Benzyl Benzoate (Plant).